The crude-oil market may have a new boss. The failure of world oil producers to reach a deal on a production freeze in Doha, Qatar, shouldn’t have been a major surprise. But the way the Sunday talks collapsed is underlining notions of a significant shift, with Saudi Arabia’s 30-year-old deputy crown prince, Mohammed bin Salman, playing a dominant role in setting policy for the world’s largest oil exporter. Oil futures trimmed sharp declines but remain lower, with the U.S. benchmark futures contract ending down 1.4%, while Brent futures settled off 0.4%. Prince Mohammed, who serves as the kingdom’s defense minister, appeared to win the day on Sunday, according to some analysts. Previously, Saudi oil minister Ali al-Naimi had left the door open to an agreement without the participation of Iran, whose unwillingness to strike a deal wasn’t a surprise. In the end, it was the prince’s hard-line call that prevailed. On the eve of the meeting, Prince Mohammed told Bloomberg that Iranian participation was a must, and warned that the Saudis were capable of ramping up production by another one million barrels a day. Iran, of course, had no intention—nor had it signaled otherwise—of participating in a freeze, focusing instead on pushing production back to presanction levels. The royal’s stance put Saudi Arabia at odds with its key Gulf allies, such as Qatar and Kuwait, “which normally stand shoulder to shoulder with the Kingdom on oil policy,” they wrote. It was Iran’s refusal to budge that likely hardened the Saudi resolve to stick to its guns, the RBC analysts said, leaving the assembled oil ministers to try their best to put a positive spin on the outcome. Not everyone is convinced that there has been a major shift in Naimi’s role. The Saudis, after all, had made relatively clear that the odds of a deal were low unless Iran and others went along, said Sarah Ladislaw, director of the energy and national security program at the Center for Strategic and International Studies, a Washington think tank. Prince Mohammed’s rising profile, however, does show that there has been “a fairly significant shift in how Saudi Arabia”is thinking about the role of oil and the shape of its economy going forward,” she said. Prince Mohammed earlier this year this year said Riyadh was weighing selling part of state-owned Saudi Aramco, the world’s largest oil producer, in an initial public offering—a move seen as part of a broader reform of the kingdom’s economy. Flynn, however, sees the prince’s ascendancy as a sign the Saudis are no longer reluctant to use oil as a diplomatic weapon. Indeed, many analysts view Saudi Arabia’s intensifying geopolitical rivalry with Iran as the motivating factor behind Riyadh’s hard line. “We can no longer look to Saudi Arabia as a reliable supplier in times of crises as we have in the past. It seems this new crew of princes are more aggressive, more abrupt, less interested in oil politics and more interested in sending a message to their enemies,” Flynn wrote. In other words, Prince Mohammed isn’t the same as the old boss. And the rest of the world will need to adjust accordingly. Cramer Remix: Is the Biotech Bear Market Over? Amid news of explosions in Belgium’s capital on Tuesday, stocks were justifiably down at the open, but then rallied for most of the afternoon and pulled back shortly before the close. By the end of the day, the stocks affected were those directly related to travel and leisure as they will have the most have a loss of business. Cramer added that the rest of the market was able to mount a comeback because there has been an underlying bid since stocks bottomed in mid-February. Beyond that, Cramer noted that another event occurred to suggest stocks are undervalued currently. Tremendously negative commentary emerged from both Transocean (RIG) and Schlumberger (SLB), with the companies stating that it could take years before things get better. But these stocks barely budged; Cramer interpreted this as resilience. The technology sector also displayed resilience; the group continued to climb though there hasn’t been any big news lately. Even the health care bear market seemed to be coming to an end, or at least show promise. Pharmaceuticals were once even more loathed than the banks after political attention turned their attention to the issue of price gouging. “I don’t want to pronounce the big bear market over in all of health care. However, it does seem to be the case that the pressure is off for now, with both big pharma and fast growing biotech stocks having reached levels where the sellers seem to have gone away,” Cramer said. In the wake of Tuesday’s terrorist attacks in Brussels, Cramer did some serious thinking. He noticed a pattern that every time a terrible attack occurs, every stock in the travel and leisure space goes lower. “That is just a fact, and an understandable one at that,” the “Mad Money” host said. However, Cramer also noticed the pattern that eventually investors stop being scared, and the travel stocks rebound. “On a day when this whole group went down, let me tell you why it could be smart to own an airline stock or a company like Priceline, but it could be foolish to bet on a cruise company like Carnival (CCL) or Royal Caribbean(RCL),” Cramer said. The difference for Cramer was related to another story in the headlines recently — Zika virus. The stocks Cramer found were most immune to Zika were airlines and online travel agents, with Delta, United, American and Southwest (LUV) all trading at cheap levels. Cramer also noted that Yum Brands, the parent of KFC, Taco Bell and Pizza had has roared 20 percent in the past six weeks. He attributed the success to Yum reporting a strong quarter in February, and because Yum broke itself up in a move that Cramer thinks could unlock immense value. “So if you have been sitting on the sidelines watching this stock rally, I’ve got news for you: it is not too late to buy Yum,” Cramer said. Since the market bottomed in mid-February, commodities have dramatically rebounded from their lows. Cramer has watched as everything from copper, iron ore, aluminum to oil have worked their way higher. While the rally took a break on Tuesday, commodities have been on the decline for years, leading Cramer to ask if this is a genuine rally or simply a long overdue, oversold bounce. Cramer turned to the help of Carley Garner to look at the charts and assess what the future of the commodity complex could look like. Garner is a technician and commodities expert who is the co-founder of DeCarley Tradingand a colleague of Cramer’s at RealMoney.com. Garner found that while it has been tough to be bullish on commodities in the past, the group could finally be showing promise. This is significant to Cramer, as the strength in commodities is a huge reason why the stock market has been able to roar higher since February. Cramer was also saddened by the news of the passing of Andy Grove, one of the founders of Intel, who understood the business better than anyone he had ever met. “Thank you, Andy Grove, for all you did to make it so everyone could afford computing. Thank you for all you did to create so much wealth for so many. Thank you for showing that raw intelligence, hard work and honesty can indeed pay off in this great country,” Cramer said. Oil fell more than 2 percent Friday, extending the week’s loss to the largest in eight months, pressured by swelling storage of crude on both land and sea. Prices slipped slightly after Baker Hughes reported the number of oil rigs operating in the United States rose for the first time in 11 weeks. The weekly count ticked up by 2 rigs to a total of 574, compared with 1,578 at this time last year. U.S. crude traded slightly above $40 a barrel, while benchmark Brent was less than $2 from setting new 6½-year lows. The slump widened to oil products with U.S. gasoline tumbling to 10-month lows. Oil prices have fallen in seven of the last eight sessions, with losses accelerating after U.S. government data on Thursday affirmed a seventh weekly rise in U.S. crude inventories that took stockpiles near April’s record highs. U.S. crude’s spot contract for December was at its widest discount in nearly three months to crude slated for delivery in a year. The global glut has prompted traders to store more oil with the hope of selling later at higher prices. “The evolving bearish global balances that we alluded to all year are acquiring increased transparency,” said Jim Ritterbusch of Chicago-based oil consultancy Ritterbusch & Associates. U.S. crude closed $1.01 lower, or 2.42 percent, at $40.74 a barrel. It fell about 8 percent on the week, its most since March. Brent was off 46 cents, or 1.04 percent, at $43.60 a barrel. 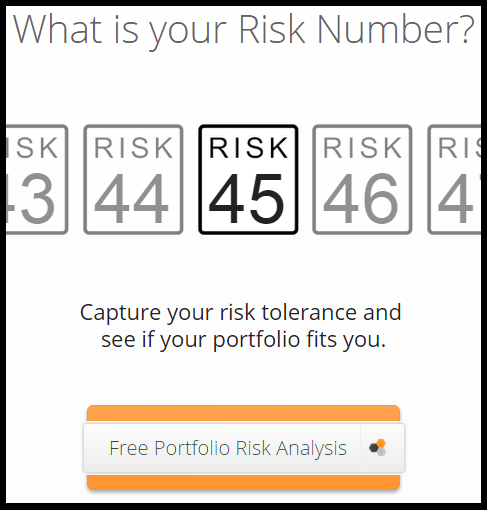 Its downside was limited by the impending expiry of its front month December contract at Friday’s settlement. For the week, Brent was down nearly 8 percent, also its most since March. The strongest El Nino weather system in almost two decades, combined with the warmest temperatures in four years, will mean a relatively warm winter in the Midwest and on the East Coast, keeping a lid on energy prices and potentially capping stock prices for companies that produce natural gas. This year’s El Nino, which occurs when Pacific Ocean waters are unusually warm, will be the strongest since the winter of 1997-1998, says Matt Rogers, a meteorologist at Commodity Weather Group in Bethesda, Maryland. Temperatures are expected to be the warmest, on average, since the winter of 2011-2012, he said. While those who like outdoor activities should enjoy the warmer weather, it doesn’t bode well for companies that provide natural gas, such as Chesapeake Energy Corp. (ticker: CHK) and Cabot Oil & Gas Corp. (COG), which already are facing near-record reserves. During the summer, companies such as Chesapeake and Cabot do what they do best – produce natural gas. In early November, when winter usually arrives, they tend to switch from putting product into storage to taking it out. Without the usual cold weather, however, none is taken out and reserves continue to build, cutting into prices. Natural gas stockpiles rose to 3.93 trillion cubic feet in the week that ended on Oct. 30, tying a record set in 2012, according to data from the Energy Information Administration. That’s pushed prices below $2, only the third time in 13 years that’s happened, says Phil Flynn, a senior market analyst at Price Futures Group in Chicago. Cabot Oil & Gas, an independent company that explores and develops oil and gas properties in the U.S., says it will reduce its capital expenditures to $850 million as it attempts to improve operating efficiencies. The company also says it plans to reduce rig count at one of its sites by the end of the year. Growth in 2016 likely will be from 2 percent to 10 percent, depending on whether natural gas prices remain low or begin to rise. Even with low prices, the company said it plans to accelerate production growth in 2017. Investment banking firm Howard Weil lowered its target for COG stock from $33 to $31. Chesapeake Energy earlier this month lowered its capital guidance by 14 percent to $3.4 billion, saying lower natural gas and oil prices present “many challenges” for the energy industry. About 70 percent of the company’s revenue comes from natural gas. The company lost $83 million in the third quarter, or 5 cents per diluted share, versus net income of $251 million, or 38 cents a share, in the same quarter a year earlier. Revenue dropped by almost half to $2.89 billion. Chesapeake’s other issue is the company is heavily leveraged, so each 10-cent move in natural gas prices has about a 5 percent effect on the company’s bottom line, Morris says. That’s about three times the industry average of 1.5 percent, he says. Range Resources Corp. (RRC), another company whose bottom line ebbs and flows with natural gas prices, also has some upside potential after it unloaded its Nora assets in Virginia – about 3,500 operated wells on 460,000 acres – for $876 million on Nov. 4. That caused stock prices to jump nearly 10 percent the day the sale was announced. The sale will reduce debt by 24 percent and reduce operating expenses, Range says. Morris said Citi upgraded RRC stock to a “buy” after it recently fell to a 52-week low, and the asset sale will only help the company’s bottom line. Still, it’s not just low natural gas prices that are threatening to hurt companies further – most can weather the storm when one commodity plunges. This year, however, energy prices across the board are low, blocking alternate sources of revenue, Flynn says. U.S. crude oil, called West Texas Intermediate, in August fell to the lowest price in more than six years and is down 43 percent in the past year. Propane prices have fallen to the lowest in a decade. That leaves companies, including Chesapeake and Cabot, with no safe haven should forecasters’ prognostications come true and the U.S. winter truly is warmer than normal, Flynn says. The equity market strained its eyes last week with all of the intense Fed watching. The gains posted early in the week began to crack on Wednesday when Federal Reserve Chair Janet Yellen hinted at a “live possibility” of a rate hike following its mid-December meeting. The market’s enthusiasm was also held in check on Friday following the promising jobs report, which many believe will make a rate liftoff in December a slam dunk. Despite this, stocks still managed to post gains for the week. The S&P 500 index rose 1 percent, the Dow Jones Industrial Average climbed 1.4 percent, and the NASDAQ composite jumped 1.9 percent. No matter how you slice it, the October jobs report was strong. Non-farm payrolls added 271,000 jobs. 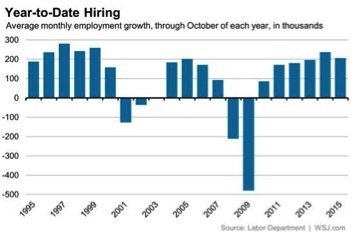 This not only blew away the consensus estimates but pushed the monthly average above 206,000 new jobs for 2015. This is the second highest figure since 1999. On top of this, the unemployment rate dipped to 5 percent, its lowest level since 2008. Even the broader measure of underemployed workers, which includes part-time employees who are seeking full-time gigs, fell below 10 percent for the first time in seven years. The manufacturing sector displayed some weakness, but almost every other industry showed strength. In fact, the dispersion index – a measure of the breadth of job growth – expanded to 61.8 percent from below 54 percent last month. Most importantly, wages are finally starting to rise. Earnings jumped 2.5 percent on a year-over-year basis. This is the fastest rate in six years and shows steady improvement each month for the past three. The impressive jobs report has pushed the odds of a December rate hike by the Federal Reserve to 70 percent. This was below 60 percent the day before the jobs report release and just 38 percent one month ago. The increased prospect of a Federal Reserve liftoff in December has pushed the value of the U.S. dollar to its highest level in almost 13 years. The Wall Street Journal Dollar Index, which values the dollar against a basket of 16 currencies, jumped 1.2 percent on Friday following the positive jobs report. This is its highest level since December 2002. 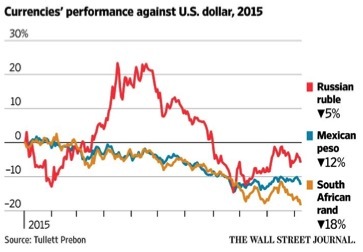 Individually, emerging market currencies suffered the most. The Mexican peso fell 1.2 percent, the Russian ruble declined 0.9 percent, and the South African rand collapsed 2 percent. A stronger dollar tends to hurt commodity-based emerging economies by making exports more expensive. Additionally, emerging countries tend to issue a significant chunk of debt denominated in dollars, and a rising greenback makes it harder to repay. Late last week China officially entered a bull market when the Shanghai Composite Index closed more than 20 percent above the lows posted on August 26. Investors have returned to the market after the rout experienced in late August. 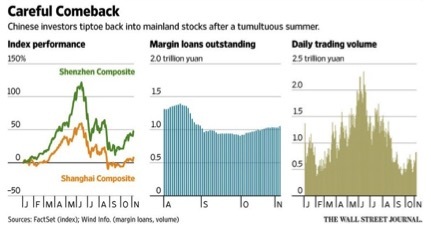 Margin loans are increasing and daily trading volume is rebounding as efforts by the Chinese government to stabilize the markets appeared to have worked, for now. The return of the market has prompted the government to lift its temporary ban on initial public offerings. The China Securities Regulatory Commission recently approved 10 companies for listing, and shares are expected to begin trading within a few weeks. The falling leaves and shorter days are sure signs the autumnal equinox has passed. More commonly known as the first full day of fall, we are more than a month beyond this annual milestone. However, last week marked a much more rare event: the “sports equinox”. This rare occasion occurs when the stars align for sports fans and all four major U.S. leagues host at least one game on the same day. Sunday, November 1 included game 5 of the World Series, 12 NFL games, seven NBA contests, and five NHL matchups. There have only been fifteen such occurrences in history, and this year marks the first “sports equinox” since 2010.